Profitable Hot Dogs with Great Brand Recognition To Grow! Restaurant Opportunity for Owner/Operator… Easy to run ! East Bay Area Suburb with a re-vitalized and happening downtown district! Very Nice Downtown area dense with retail, coffee shops and restaurants. High Quality Hot Dog Concept with Great Reviews! This is a Local favorite and can be operated as a single store business or grow to multi location operation. The owner has done an excellent job in creating a very scalable brand and the menu and products are top notch. The owner has created his own distinct menu of Specialty hotdogs. The ingredients are all made to owner “specs” by a major high end hot dog brand, under the sellers label. If your looking for a single store “ Easy to Operate” entrance into the restaurant business…this place is all setup, currently operating & ready to go. The seller has marketing and catering relationships established in this community… including Auto dealerships, Wineries, Corp. parties and more to be added. Upside: A new owner could add a hood system and add French Fries, Corn dogs and other related items to increased sales. Currently owner only works about 10 hours per week in the business. Type 40 Beer License is included! Seats 18 indoor with 12 Outdoor Patio seating too! 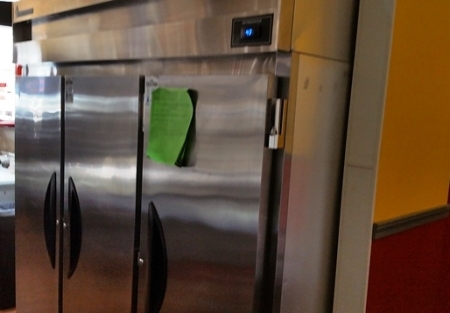 Kitchen is approved as a commissary, so you could add more food carts! FF&E: 3 Door Refrigerator, 2 Door work top refrigerator, 2 single door bev refrigerator, 5 well steam table, Pots pans/utensils/ all other wares to run business, tables & chairs , 2 60 inch TVs, 2 “Dog House” rental units( Addl. income …easily rents to customers for their own catered events), 1 Fully permitted mobile food cart !...1 Trailer …1 Branded popup Canopy. Web Site/online ordering ...Facebook over a 1000 likes…apparel. Lease: Good Rent at $2,225… All In for 1,100 sqf., plus patio! Open 7 days. Reason for selling: The Seller has family health matters out of state. Make an offer quick... this will be gone fast! The Seller will consider Serious offers! Please go to SellingRestaurants.com to get the name and address along with photos of this business.